San Diego's Comic-Con International runs from July 19 to July 22. Put simply, Comic-Con International: San Diego is the granddaddy of comic and sci-fi conventions. Every year, the conference center fills, the streets of the old Gaslamp Quarter are packed and the carnival atmosphere is in full swing with enthusiastic sci-fi fans and out-of-this-world costumes. So you don't get lost in a maelstrom of marketing at this year's Comic-Con, which runs from July 19 to 22, we've scanned the schedule and pulled out the can't-miss panels and screenings that space lovers should make their top priority. Comics and science fiction fans come from far and wide to attend Comic-Con in San Diego. The most important thing to remember if you've never been to San Diego Comic-Con before is that you won't be able to do everything; there's just too much going on. The convention isn't limited to the conference center; there are events, talks and panels held in venues all around the Gaslamp Quarter and downtown. Even the nearby baseball stadium, Petco Park, is sometimes used for special events. So the way to guarantee maximum enjoyment is to carefully plan your itinerary and factor in time to get from one location to another. Hall H is something of a legend. This is the single biggest room in the San Diego Convention Center, with a capacity of over 6,000, and it is used for only the very biggest and most high-profile panels. Queues for Hall H wrap around the building, along the waterfront and beyond. To ensure you get into the event you want to see, you'll be required to spend the best part of a day in line. Consequently, if you're attending on your own, you'll have to sacrifice everything else that's on for the day. As veterans of San Diego Comic-Con, we recommend you go in groups of at least four, if possible, with two setting up camp under a beach umbrella — you'll be thankful you brought one along — and the other two wandering off and watching whatever they want. Then, after a little while, you swap. Agree beforehand who wants to see what, and make a fair plan accordingly. Hand sanitizer: You're going to be tired and exhausted by the end, and this can help reduce your chances of coming down with something. Sharpies (black and silver): You will run into celebrities and industry icons, so be prepared so that the chance to get their autograph doesn't slip away. An extra battery for your smartphone: You'll be relying on your smartphone for a lot — camera, phone, maps, social media — and it will get drained. You might even want to bring two extra batteries. 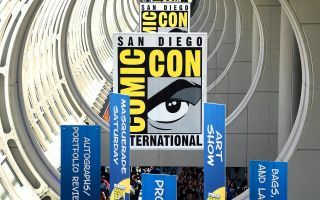 The power of Twitter: News of a celebrity spot travels like wildfire at Comic-Con; by keeping a close eye on #SDCC, you can find the cool parties and the awesome giveaways. Finally, wear comfortable shoes and bring sunscreen, sunglasses and a poster tube. Writer/director Spencer F. Lee brings together Nichelle Nichols, Rod Roddenberry, Kerry O' Quinn, Tom DeSanto, Cecil Grimes, Douglas Tait and Greg Grunberg to introduce their new documentary on the evolution of science fiction and fantasy comic books and the positive impacts that they have had on society as a whole. "When Earthlings Become Martians: National Geographic's Mars, Season 2"
The show's foremost experts on terraforming the Red Planet give an exclusive peek at what's to come. Author Jennifer Kite-Powell will be joined by Stephen Petranek (author of "How We'll Live on Mars"), Andy Weir (author of "The Martian"), former NASA astronaut Leland Melvin, as well as cast members JiHAE and Jeff Hephner and executive producer Dee Johnson. Time: 11 a.m. to 12:00 p.m.
Jodie Whittaker, the Thirteenth Doctor, will make her Comic-Con debut, marking a new era for the legendary Time Lord. Whittaker will be joined by co-stars Tosin Cole and Mandip Gill, series showrunner Chris Chibnall and executive producer Matt Strevens. The "Stargate" franchise made an invaluable contribution to television sci-fi, and Kieran Dickson will moderate a discussion with panelists Christopher Judge, Darren Sumner and David Read as they share their creative process and behind-the-scenes stories. "2001: A Space Odyssey 50th Anniversary Panel"
Panelists will examine Stanley Kubrick's science-fiction masterpiece "2001: A Space Odyssey," which will be released in 4K Ultra High Definition this fall. The stars of the film, Keir Dullea and Gary Lockwood, and an impressive array of scholars will give attendees a glimpse at the remastered footage and host a lively discussion of this landmark movie. "Snoopy Space Traveler: The History and Future of Snoopy and NASA"
Discover how cartoonist Charles M. Schulz partnered with NASA to bring everyone's favorite beagle to the moon in this retrospective panel about the history and future of Snoopy in space. "The Science of Star Trek"
Morgan Cable (NASA, Europa Lander), Jessie Christiansen (NASA), Phil Plait (Syfy Wire's The Bad Astronomer), Hallie Lambert (writer, "The Expanse") and André Bormanis (science consultant for "Star Trek," "The Orville") discuss the real science behind sci-fi's most beloved universe. Time: 5:45 p.m. to 6:45 p.m.
Marc Scott Zicree ("Star Trek: The Next Generation") and visual-effects geniuses Joe Lawson and Tobias Richter ("Star Trek: Voyager") present the world premiere of "Space Command," the epic adventure series that spans 150 years of galactic history. The cast includes Doug Jones ("Star Trek: Discovery"), Robert Picardo ("Star Trek: Voyager"), Mira Furlan ("Babylon 5"), Bruce Boxleitner ("Tron," "Babylon 5") and Faran Tahir ("Star Trek," "Iron Man"). Some of the cast members will be present, but we don't know who yet. "Publishing: Stories from a Galaxy Far, Far Away!" Michael Siglain (creative director, Disney-Lucasfilm Publishing) and surprise panelists share previews and exclusive announcements about what should be on your must-read list from "Star Wars" publishing. Expert panelists Kim Steadman (NASA JPL), Emily Manor-Chapman (NASA JPL), Kieran Dickson (MGM Studios), Fon Davis (production designer, "Star Wars"), Steve Huff (fight choreographer and weapons expert), Eliot Sirota (visual-effects expert) and host Jenna Busch will delve deep into the minds of "Star Wars" creators and break down the science behind a galaxy far, far away. Q&As, surprises and giveaways will follow. "To Infinity & Beyond: Our Dreams for the Future Take Flight"
For centuries, from Nicolaus Copernicus and Jules Verne to Elon Musk and Jeff Bezos, visionaries have offered their dreams of the future and, in doing so, inspired mind-blowing innovation. An all-star panel of creators and innovators discuss their greatest influences and what they envision for the future. "Star Trek: A Fandom Divided?" "Star Trek" author Larry Nemecek hosts a panel of "Star Trek" podcasters asking if age, or even tech affinity, is amplifying the controversies surrounding "Star Trek: Discovery" or if it is all much ado about nothing. You can be a part of the Q&A, which will be recorded live for later podcast use. "Moonbase and Beyond: The New Push to Deep Space"
A scene from 2017's Comic-Con in San Diego. After a mind-blowing Season 1 finale that saw Krypton's history drastically rewritten, the future of Superman has never been in greater jeopardy. Cast members Cameron Cuffe, Ann Ogbomo, Wallis Day and Shaun Sipos and showrunner Cameron Welsh give an inside look into what fans can expect in Season 2. Time: 12 p.m. to 12:50 p.m.
"Explore the Wonders of the Universe with Cosmos: Possible Worlds"
The Emmy Award-winning science program "Cosmos: A Spacetime Odyssey" returns to Fox and National Geographic in spring 2019. Get an exclusive sneak peek at the upcoming season as host Neil deGrasse Tyson and executive producers Seth MacFarlane, Brannon Braga and Jason Clark discuss more on cosmic evolution. Time: 3 p.m. to 3:50 p.m.
"Hollywood & Emerging Tech: The Next Level of Entertainment"
Celebrate the intersection of entertainment and virtual reality, augmented reality, extended reality and other cool technologies making the world a more exciting place. You can also immerse yourself in these experiences at the Future Tech Live! pavilion in the Omni Hotel. Cast members from "The Orville" — including Seth MacFarlane, Adrianne Palicki, Penny Johnson Jerald and Scott Grimes — and executive producers David A. Goodman, Brannon Braga, and Jon Cassar give an exclusive look at some of the new and exciting missions in the upcoming second season. Time: 4 p.m. to 4:50 p.m.
"Alien Worlds: NASA's Quest for Life"
"Genetic Mutations: Will We All Be Metahumans One Day?" In shows like Marvel's "X-Men," "Runaways," "Jessica Jones" and "Luke Cage" and Netflix's "Stranger Things," people with genetic mutations are often portrayed as having superpowers. How realistic is the science behind these superpower-creating mutations? Panelists include Craig Titley (producer, "Agents of S.H.I.E.L.D. "), Akela Cooper (producer, "Luke Cage"), Frances Barron, Brett Goldsmith (chief technology officer, Nanomedical Diagnostics), Troy Sandberg (bioengineer) and Steven Snyder (CEO, Fleet Science Center). From Academy Award winner Robert Zemeckis, "Project Blue Book" is based on the true, top-secret investigations into UFOs and related phenomena conducted by the U.S. Air Force from 1952 to 1969. Series stars Aidan Gillen ("Game of Thrones"), Michael Malarkey ("The Vampire Diaries"), Neal McDonough ("Captain America," "Star Trek: First Contact") and Laura Mennell ("Watchmen") share what's to come in this highly anticipated new drama series and reveal an exclusive sneak peek of the first season. Director Taika Waititi, actors Chris Hemsworth, Tom Hiddleston, Mark Ruffalo and Cate Blanchett from "Thor: Ragnarok" helm a panel at the San Diego Comic-Con International 2017. "The Science of Comic Vampires and Zombies"
In a panel moderated by Jonathan Bacon-Liu (host of "All the Time We Have" podcast), Jonathan Maberry (author, "V Wars") will bring his expertise in all things scary as he is joined by Ronald Coleman (expert in regenerative medicine) and Sharon Schendel (expert in immunology) to talk about how these monsters might work in the real world and where science and imagination intertwine. Time: 10 a.m. 11 a.m.
"'Disco' Was My First: Any Star Trek Newbies?" "No Tow Trucks Beyond Mars"
NASA JPL's David Rosing, Shonte J. Tucker, Robert Lock, Kobie Boykins and Laura Kerber discuss how they go boldly when there's no one around to fix it. Hear stories from the trenches of the heartbreaks, close calls and adventures of real-life solar system exploration. "Starship Smackdown XXV: The Final Countdown"
Time: 2:45 p.m. to 4:45 p.m. The Past and future collide when Wild West fantasy requires robots with advanced AI. What is the appeal of live-action role playing? How far will people go in pursuit of violent delights? Travis Langley ("Westworld Psychology: Violent Delights"), Fon Davis ("Star Wars"), Steven Huff (fight choreographer and weapons expert), Allen Pan ("MythBusters"), Sarah Petkus ("Robotic Arts"), Tamara Robertson ("MythBusters") and Martin Lloyd ("Westworld Psychology: Violent Delights") will look into the dark side of this sci-fi fantasy. "Harlan Ellison: A Celebration of His Life and Works"
The sci-fi world recently lost a legendary writer, Harlan Ellison, but the stories he left behind are legendary. Attend this loose and likely profane celebration of the man and his writing as moderator Chris Ryall welcomes Josh Olson, Bill Sienkiewicz, William Stout, Erik Nelson, Steve Barnes, Jud Meyers, Scott Tipton and Christine Valada. Attendees will get a complimentary print, too.